Flexible electronics or Flex circuit is the technology for the assembly of circuits on a flexible plastic substrate such as Polyimide. The Flex circuits can be easily flex or bend during its use. The Flex circuit board is manufactured using Polylithographic technology. The Flex circuits find applications like Camera, Cellphone, Satellites etc. Flex circuits are used as connectors where flexibility is needed and they reduces the space considerably. A common application of Flex circuit is the computer key board. LCD display can also be made using Glass or thin transparent foil as substrate so that the entire system can be flexible. 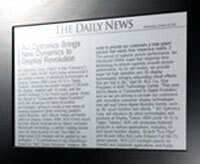 Organic LED (OLED) is used in such displays instead of the back light. The thin film of OLED along with the substrate form a flexible LCD display.